MAAC® Calf Booster provides a rapidly available source of trace minerals and vitamins with Direct Fed Microbials (probiotics) to maintain the normal micro floral of the intestine of the growing calf in an easy to feed Bolus. 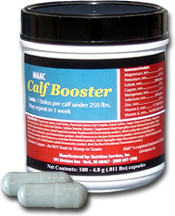 Calf Booster contains Cobalt to naturally stimulate the production of B12 in the rumen. Readily absorbed Chelated Zinc, Copper, Manganese, Magnesium and Potassium for enzymatic processes. And high levels of Vitamin E and Selenium to help the immune system.